21st.Charity Breakfast – declared a great success! 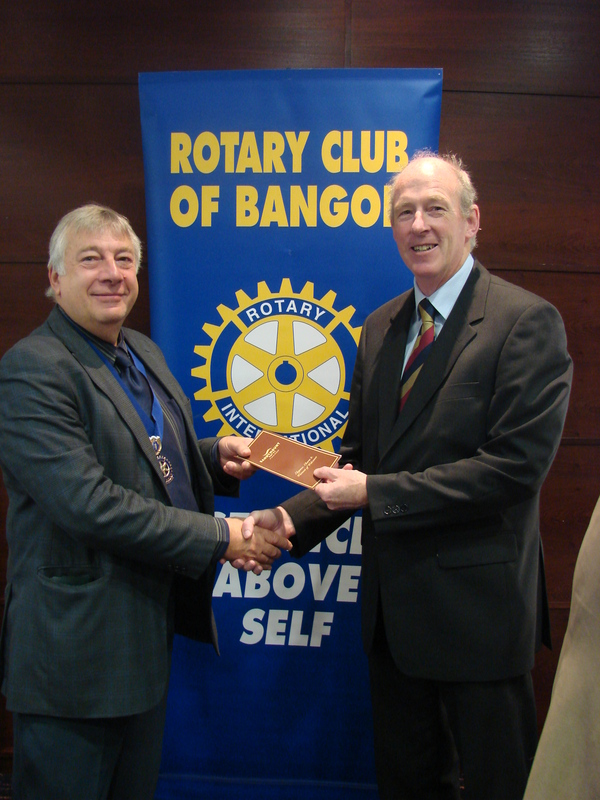 Rotary Club of Bangor held another very successful Annual Charity Breakfast on Wednesday 10 October, at Clandeboye Lodge Hotel. As ever, the event was well supported by local businessmen and women whose very generous donations raised a very substantial sum of money for this year’s chosen charities, namely, Action Cancer, ShelterBox and Rotary Foundation. enjoyed a delicious Ulster fry, The Chief Constable for NI, Mr Matt Baggot, provided a thought- provoking and, at times, amusing account of his career to date. Finally, the ballot prize, i.e. a night for two people at the Sandymount Hotel, Dublin, was won by Mr David Cunningham, a keen Ireland Rugby supporter! Mr Cunningham is pictured here, receiving his prize from the Club’s Vice- President, Ian Wilson.